How about we take a more complete look at the color range for the collection? 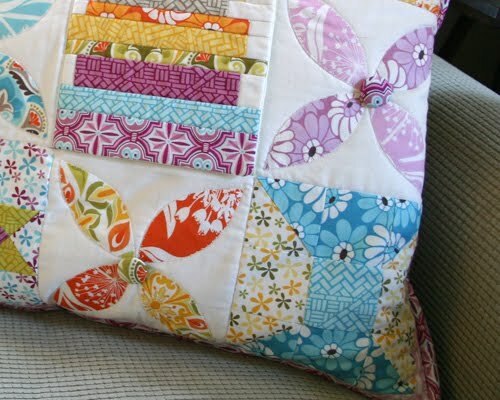 There is quite a spectrum of possibilities for color combinations and prints that lend themselves to everything from children's clothes and quilts to pillows, throws and all sorts of accessories. 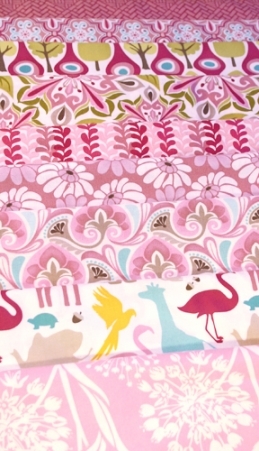 There are nine prints that also come in laminates that are perfect for reusable grocery store totes or summer beach bags. I'm sure you'll have so many other great ideas, so please be sure to share them in the Central Park flickr group. Looking forward to seeing what you make! or a visit to the Zoo! The setting sun brings the day to a close and a purple cast overtakes the shadows in the "Plaza" colorway. I love the transition from day to evening in NY; when all the lights of the city define its landscape. There is still time for one more ride on the Carousel, though! Did you know there have been 4 carousels built in Central Park since 1871? All in the same location. Here's a little more trivia (and maybe you know this already): In 1890, there was an eccentric New Yorker and Shakespeare buff named Eugene Schiffelin who decided he wanted to introduce all the birds mentioned in Shakespeare's writing to the United States. He brought 60 starlings over from Europe and let them go in Central Park. One of the first nests was spotted under the eaves of the Museum of Natural History. The birds took so well to North America, that their population today is somewhere around 200 million!! Finally, i wanted to congratulate Claudia for being last month's winner of the first-ever newsletter-subscriber-only giveaway! She won a jelly roll of Central Park. You might just want to subscribe too. The March newsletter is in-the-works. to everyone for participating. I loved reading each and every one of your comments, suggestions, wonderful ideas and all your colorful requests. In fact, i was so surprised at how many of you are on the same colorwavelength i am...eh hem...and might be tickled by what's ahead (well at least i hope you are). Can't wait to share with you soon! if you're a new reader here. I'm excited to visit your blogs to see what you're up to! Also please feel free to take a peek at the flickr groups on the right sidebar. 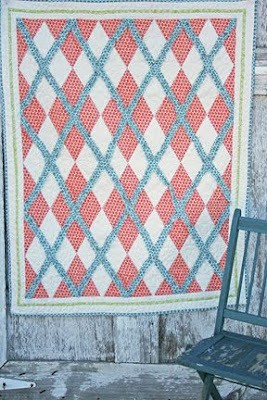 There are some amazing projects in there if you're looking for inspiration, and it's a great way to connect with other quilters and crafters. I certainly hope you'll consider joining and sharing anything you make too! Yay, Celeste! 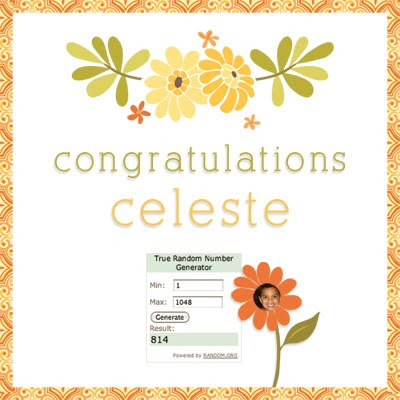 Please email me your mailing address and i'll send your prize off to you! You might remember that i said there would be some additional surprises, too? Well, there are actually 10. Surprise! 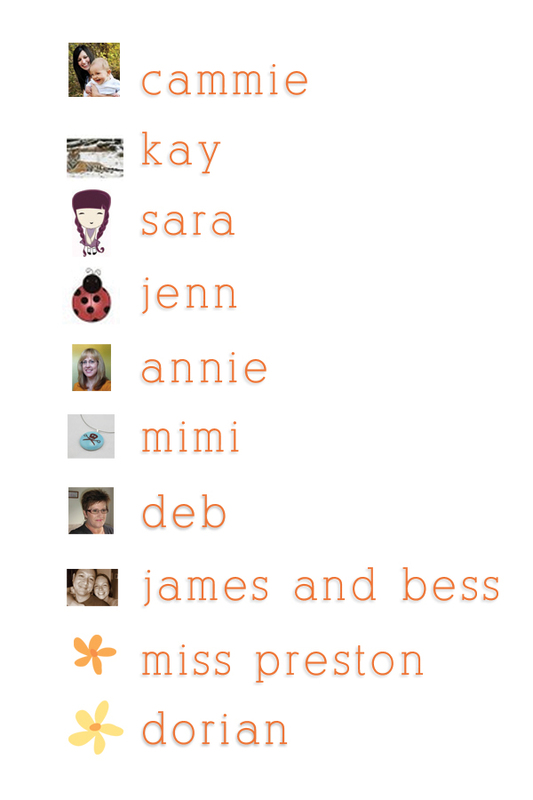 So if you're name appears here, please send me your mailing list and i'll send a little something your way. 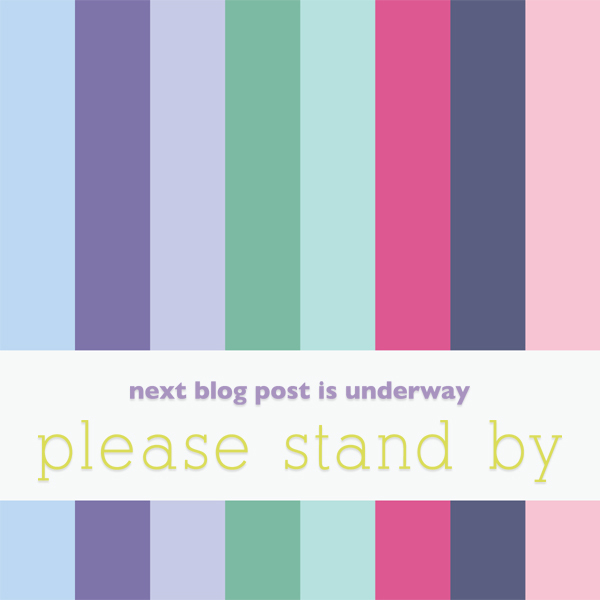 I hope you've continued to follow along the blog hop. Lots more laughs and giveaways going on that you won't want to miss. Here's the list again...with two new additions! Welcome to our Moda Pillow Talk Day 8! Have you been reading all these wonderful posts? I sure have. It's so much fun to learn (more) about these talented women through questions that uh, would not come up in a regular conversation...like ever. Not to mention that Sandy is doing a painting-a-day to go along with the hop! You have to go see how cute they are. Joanna is practically giving away the farm in her giveaway, and i think tomorrow is the last day to win a designer iron over at Anne's! **oops, nope. she picked a winner today. maybe it was you? If you're a new reader here and are just beginning your hopping...welcome to our happy little Moda family! You probably want to know what this is all about, right? Well, last fall at Quilt Market, Moda held a Schoolhouse called "Pillow Talk". Our fun-loving, brilliant marketing director (and maker-of-mischief), Lissa Alexander, asked each of us to make a pillow that told about us and our journey as a designer. 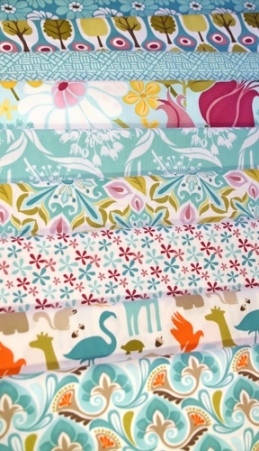 It was the first market where i had a booth and when Lissa's email came in, i was in a sewing frenzy (understatement). Before designing fabric with Moda, I really didn't sew. But i love to learn new things. I had learned about nine-patch quilts and thought that would be the perfect place to start: a simple grid. Nine squares. I can do this. My biggest hurdle is always where to start telling the "story". The beginning seemed good. So, i was born in New York City. See that square in the upper left corner? Yes, the city skyline.. The next significant step along my path was when i went to art school. At RISD, we were challenged to think creatively with playful freedom and to explore possibilities, but in a very deliberate way. Does that make sense? So if you go back to the first pillow picture, and look at the square in the upper right corner, i tried to embrace that same idea by sewing with reckless abandon! No plan other than color and of course, block size. 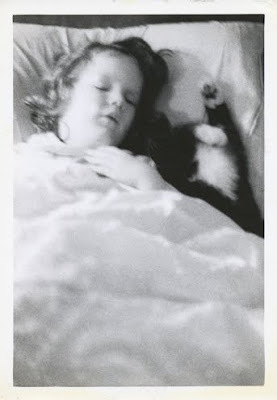 ...but eventually i had to say "Goodbye Kitty" when i hit another career path fork-in-the-road. This was really when i decided i needed to be making my own art. I had a booth at Surtex (an industry trade show) in NY which is where manufacturers go to find original art to put on their products, and met an agent who i began working with. 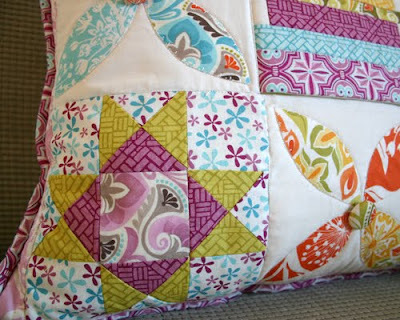 Around this time, i had shown some of my designs to family members, one of whom is an avid quilter. (aka: Moda) for allowing me to do something which brings me a joy i had not known. And now there are spools of thread (lower right corner traditional block called "spool") all around my studio and thread on the floor, and stuck to my socks, and stuck to my sweaters and in the dryer and the refrigerator! Poke, poke. You still awake? I’m pretty handy with a plumbing wrench (you can stop laughing now). I didn’t know this until we bought our house and certain things needed fixing and upgrading. The sink in our bathroom was so tacky (i’m being nice here) and from the day we moved in, we wanted to replace it. Right around that time, my sister-in-law and her husband were renovating and about to toss their 1940s porcelain-covered cast iron bathroom sink into the dumpster, but asked if we had any use for it. 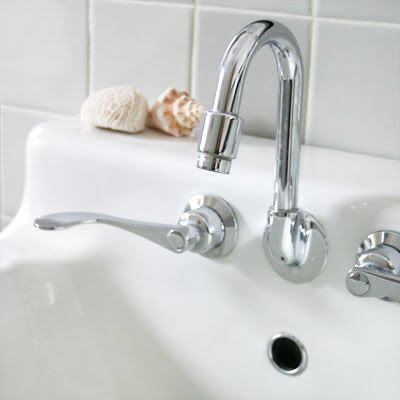 I happen to love those old sinks, so we snatched it up. And a little confidence is a dangerous thing — since then, i’ve replaced our kitchen faucet, repaired a leak in our bathtub, installed a new shower head, and fixed a rotary ball faucet. We only had to call Roto-Rooter once to fix something i “fixed”. And in case you're wondering, the answer is "no" i don’t make house calls. Another little known fact about me: I never leave home without chapstick. Oh, and last one: I would eat hot dogs every day of the week if they were good for you. I cook. There’s something about the repetitive actions of prep-work (like chopping, dicing, slicing, and mincing) that i find very relaxing and meditative. 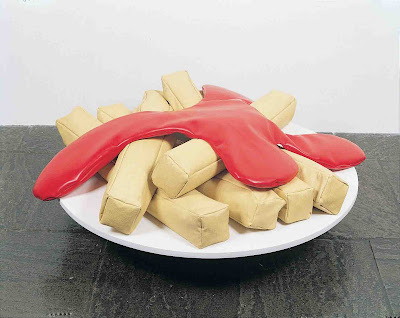 I also like to make bread and anyone who has ever hand-kneaded dough might know what i mean about how relaxing that is. It requires time, patience, and attention, and i enjoy all the care that goes into making a single loaf--even though it's hard to make any less than three at a time. A little melted butter on a slice just fresh out of the oven is a simple joy i will always appreciate. I just learned (through this hop) that Anne and Alma make bread too! Had no idea..
Just your average t-shirt and shorts. 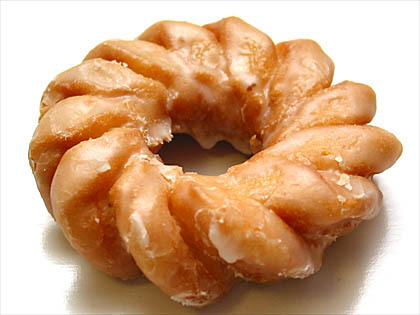 I used to wear a nightgown, but would wake up in the middle of the night twisted up in it like a pretzel, or a cruller. What kind of pillow do you like, Hard or soft, foam or feather? And why? I prefer a soft, feather cloud that i can sink my head into and barely know it’s there. I usually do Sudoku puzzles in bed. By that time of the day, that’s all the brain power I have left. If I read in bed, I usually end up re-reading what I had “read” the next day. Hot ginger tea with lemon. I’m definitely a night person and that causes lots of problems with my morning person. I think Jerry explains it best. If you've managed to read all that you deserve something special!! 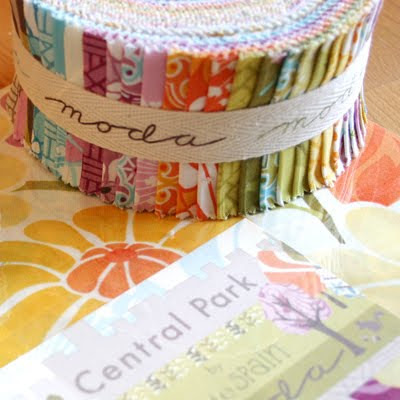 How would you like to win a jelly roll of Central Park? 1. Please let me know if there is a certain color you are craving to use in your fabric projects, but just can't find enough of out there — or a color you'd like me to consider for a future palette. 2. 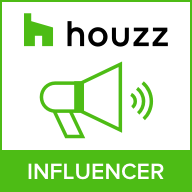 If you already follow my blog and subscribe to my newsletter, thank you! Please let me know if there's something you're interested in learning more about (other than the ravioli lesson i still owe you!). If you're new here, please sign up to follow my blog and/or newsletter and come back here to let me know. **There's something wrong with the newsletter sign-up form on my blog, so please click here to sign up from my website. Thank you! Winners for this giveaway will be picked on Sunday the 13th. And please, if you have a spare moment, try to get involved with the Million Pillowcase Challenge sponsored by American Patchwork and Quilting. It's such a wonderful cause and has helped to form special bonds for some very special people i'm lucky to know. The hop continues tomorrow over at Kathy's blog. 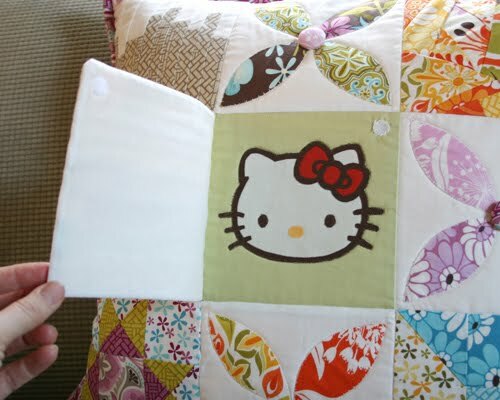 Wait until you see her beautiful pillow. Keep on hopping! 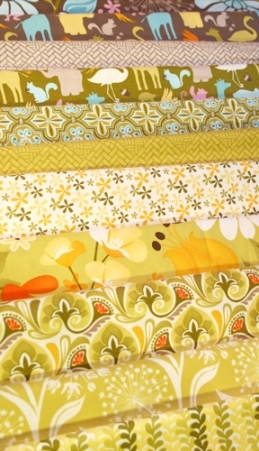 Today is the last day to get in on the Central Park fat-eighth bundle giveaway over at Pat's blog. Don't forget to listen to our chat (on the right hand sidebar) then leave her a comment to be entered to win. She'll be drawing the lucky winner tomorrow! 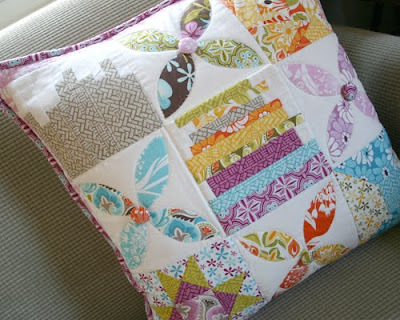 Today is February 2nd and it's also Day Two of the Moda 'Pillow Talk' Blog Hop! Alma and Barb are the two fabulous designers behind the beautiful Blackbird Designs. Hop on over to their blog to see what they have in store for you. She has been featured for her story about learning to sew through her contributions to the Million Pillowcase Challenge, and how she brightened the hospital room of her dear friend Kristen — a leukemia patient born with Down syndrome. Sadly, Kristen passed away last summer but she is remembered and honored every day at JEllen's where they continue to make and donate pillowcases. 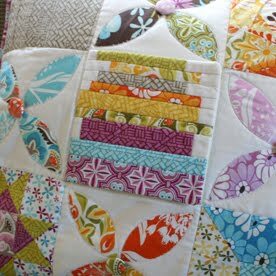 Sarah is also making quilts to donate to Reece's Rainbow. You can read all about how Sarah, Joyce and i met in this post. And you may have heard me talk about them with Pat Sloan the other day. When i was digging back to find that post, i was so surprised to see that it was almost a year ago. You just can't believe what these two have done in that time — it is remarkable. Speaking of remarkable, there are two other women who have some pretty exciting stuff happening that i've been eager to share with you. Not only because they welcomed me into the quilting world with wide open arms, but also because they're both very talented in their own right. 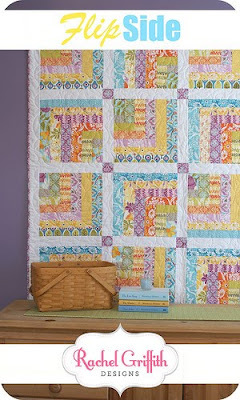 Yes, i'm a wee biased because she used Central Park, but it's such great quilt design for the jelly roll lover in you, that i bet it would look good no matter what fabric you use. But you really want to use Central Park, right?? *wink* Congratulations, Rachel! 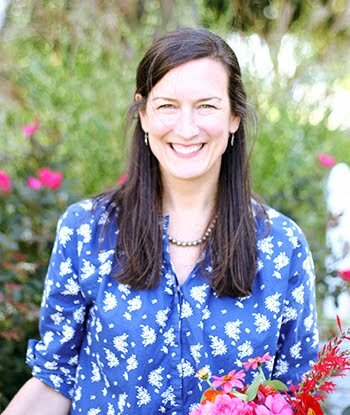 The second woman is Vanessa Christenson, the creative mind and bubbling spirit behind V and Co. Vanessa has a clean and simple style to her designs that invite even beginners (like me) to take on sewing and craft projects with a certain degree of confidence. And what do Rachel and Vanessa have in common? They were the first two people i knew of who made the first things i'd ever seen with my very first line of fabric. They're pretty special to me and i'm so very happy to applaud their successes. Today begins what is sure to be lots of fun and you're invited to join in! Maybe you've heard about it already? 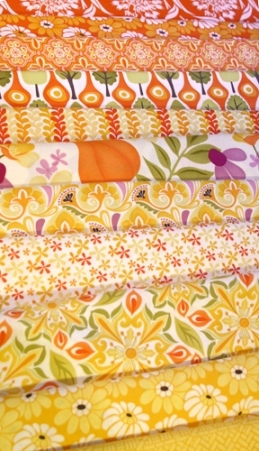 It's the first-ever Moda designer blog hop! But what do pillows have to do with anything? 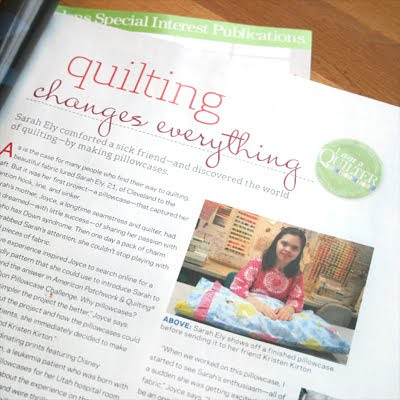 Well at Quilt Market last October, the brilliant marketing maven at Moda (say that three times fast! 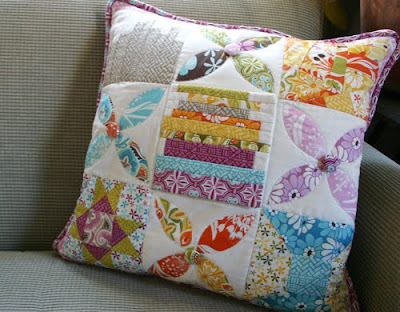 ), Lissa Alexander had each of us make a pillow that told something about ourselves and our journey as a designer. So we'll be showing the pillows we made and telling you about them. But as with most things "Moda" there's always a twist of silly fun added so Lissa has also asked all of us to answer some verrrry interesting questions...! And there will be prizes all along the way, so you'll want to visit everyone. 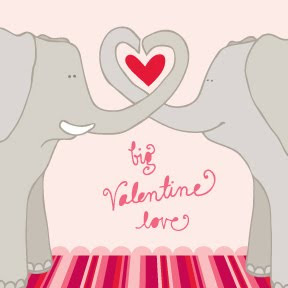 Have fun and hop on over to Aneela's blog to start things off!